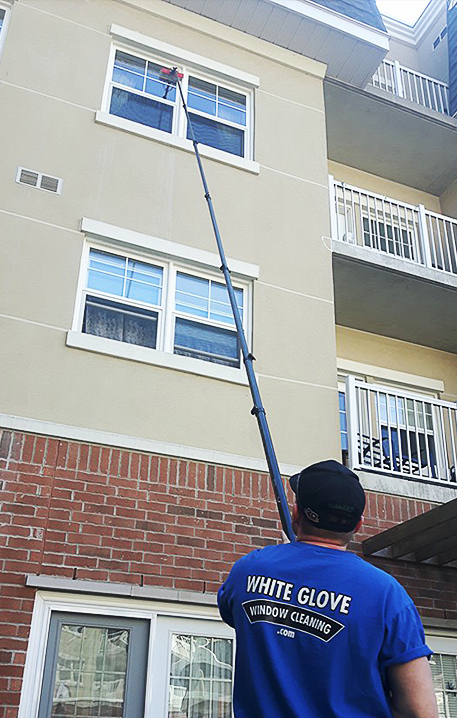 The professionals at White Glove are, beyond doubt, the best choice for commercial and residential window cleaning services. With over 30 years of industry experience, our technicians are fully equipped to serve all of your needs with high-quality workmanship and top-notch customer service. In addition, we are happy to provide a wide range of additional services for your property, including construction cleaning, solar panel cleaning, and more. Contact us now to learn more. With this service, we remove the screen, wash it, and then reinstall it. We then clean the exterior of the glass while also washing the sill. This service includes a full cleaning of just the exterior portion of the glass- it does not include the removal of the window itself, storm, or screen. We then offer a careful washing of the sill. This service includes the full cleaning of the interior and exterior of the windowpane. We carefully clean screens to remove loose dirt, wash the windowsills, and wipe down the track. This service is also sometimes called an inside and out service. This service starts by removing windowpanes. We then clean both sides of all four windowpanes before re-installing. Afterward, we clean screens, window tracks, and sills for optimum cleanliness. Only vinyl and modern manufactured windows apply. At White Glove, we form meaningful alliances with each and every client that we work with. We stand by our commitment to customer service and take great pride in helping our customers present their clients and employees alike with a clean, kempt space that promotes positive outcomes and productivity. Our trained window cleaners provide crystal clear appeal for any commercial structure; office, industrial, high-rise and storefront windows, restaurant, resort and hotel windows, hospital and school windows. We offer a wide range of scheduled services that include; weekly, bi-weekly, monthly or quarterly. Our short-term, rotating contracts demand that we continue to keep earning your loyalty, month after month. We work directly with building owners and property managers to carefully design a maintenance system that best suits their requirements. Our maintenance systems specifically address all safety considerations and deliver the best quality possible. White Glove accommodates any architectural design and offers certified crane operated elevated platforms for hard to reach areas, such as atriums and solariums. Dirty windows are bad enough, but dirty or streaked atrium glass creates a dark and oppressive environment that is only amplified by its size. Our service technicians are equipped to handle glass at the ground level, as well as atriums up to three stories high. Let us keep your atrium glass as impressive as it was designed to be. Contact us today to learn more. We understand that post-construction cleanup is often a necessary evil after construction crews have worked on your home or business. We are happy to examine the status of your windows post-construction and establish a proper plan of action to help clean your windows and remove debris without harming your glass, including plaster, concrete, paint, tape, and other common construction debris. Graffiti doesn't have to be annoying when you work with the professionals at White Glove. Our skilled technicians can safely, quickly, and discretely remove unwanted paint and related substances from glass and mirrors. Contact us now to remove the headache from problematic graffiti and return your glass to its original, pristine condition with our help. At White Glove Window Cleaning, we understand that you want to protect your property from the hazards associated with unclean or damaged eave troughs. The cleaning of eave troughs is an important element in building maintenance. When water gets trapped in them, as a result of leaves or other debris causing clogging, the potential effects can cause corrosion or over-flow, which can lead to flooding and invites birds and mosquitoes. The Ministry of Health encourages regular cleaning of your eave troughs as a means of protection against West Nile Virus because 60% or more of mosquitoes most neighborhoods come from clogged and otherwise untreated troughs. We use ultra-purified water to clean photovoltaic (PV) panels — meaning we will leave no chemical residuals or other inorganic compounds that may impact their performance. With our help, you'll avoid solar clouding, or solar soiling, which can greatly impact the effectiveness of your solar paneling- the cost of service greatly out valuing the reduction in efficiency over time. According to the Solar Electric Power Association (SEPA), PV electricity output will decline approximately 10% due to accumulation of dirt, dust, and other residues. Research cited by SEPA indicates that PV electricity generation will decline 15-20% in areas where bird droppings, urban pollution or dust from farming operations are common. Annual or bi-annual cleaning of panel surfaces eliminates these efficiency losses. Contact us today to schedule you.